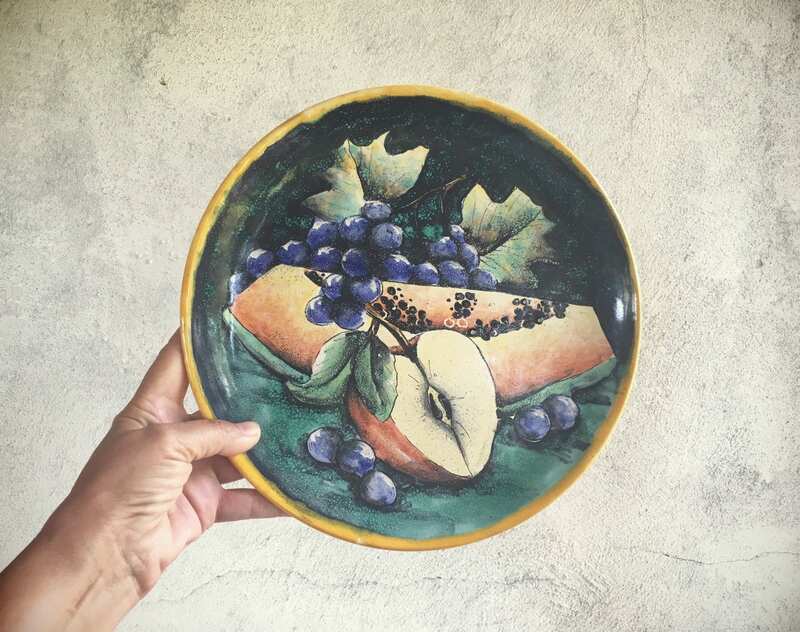 Gorgeous decorative plate from the town of Santa Rosa in the state of Guanajuato, Mexico--this piece is features luscious fruit, which if you've ever been to Mexico you know tastes better than most anywhere else. The border is vibrant golden yellow. 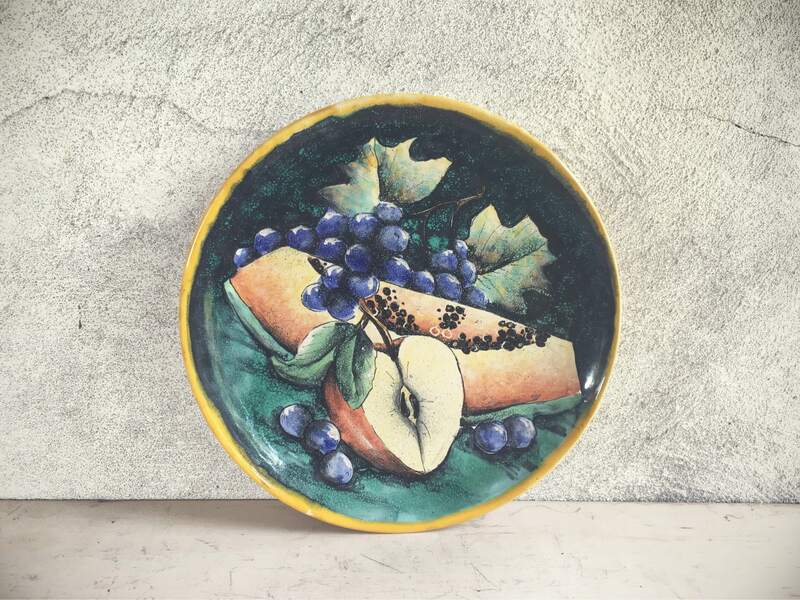 One of the hallmarks of Santa Rosa Mayolica is its deep colors and unique style of painting that makes it look almost mottled. This form of pottery was brought with the Spaniards in the 16th Century and wherever it is made in Mexico, it has regional differences. In Santa Rosa, the clay is taken from the Sierra de Santa Rosa mountains. There are several glazing processes and some painting in between glazings, which give the design that mottled and glossy effect. 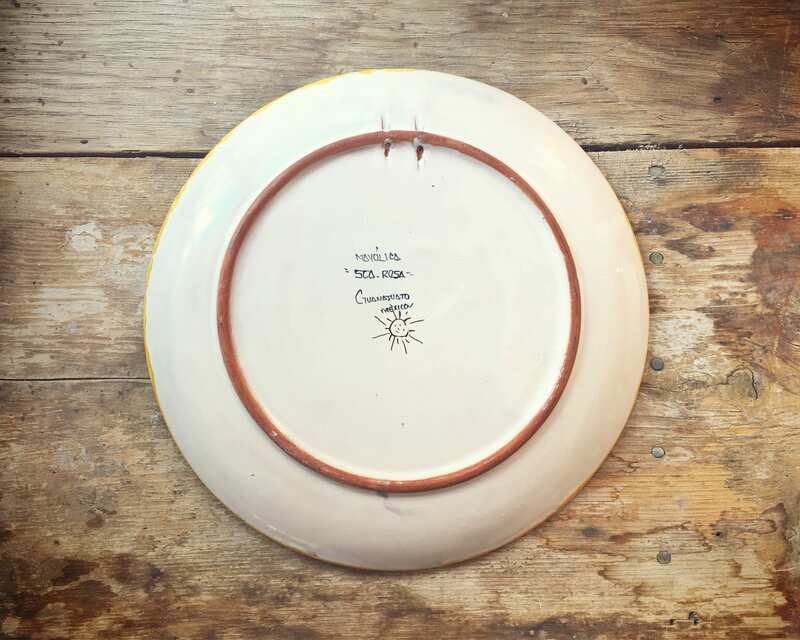 The plate is decorative, which we know because of the holes in the back for twine to hang. 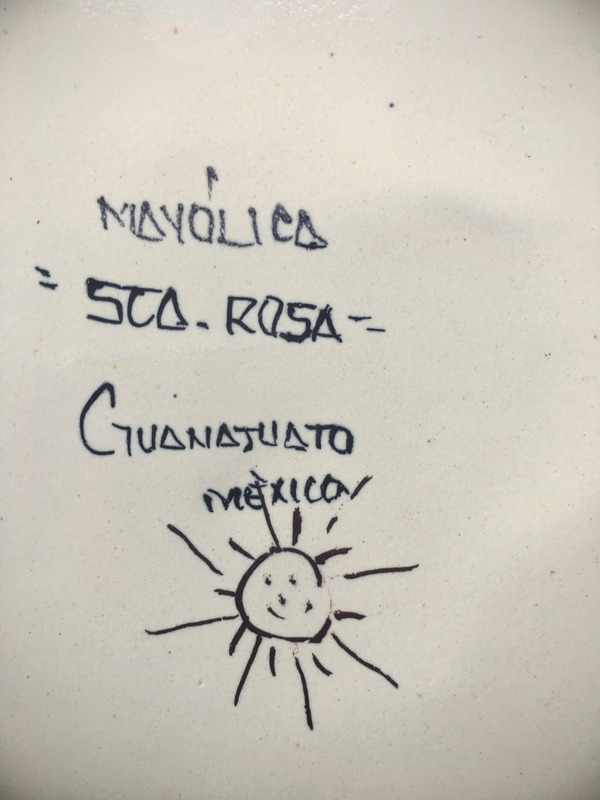 The back is signed Mayolica Sta Rosa Guanajuato, Gto Mexico, and the artist's "signature," which is a sunface. Measures 10-3/4" in diameter. In great vintage condition with no chips, cracks, nor crazing. There are a couple of spots where the paint was missed or uneven, which may look like paint flakes but are actually not. 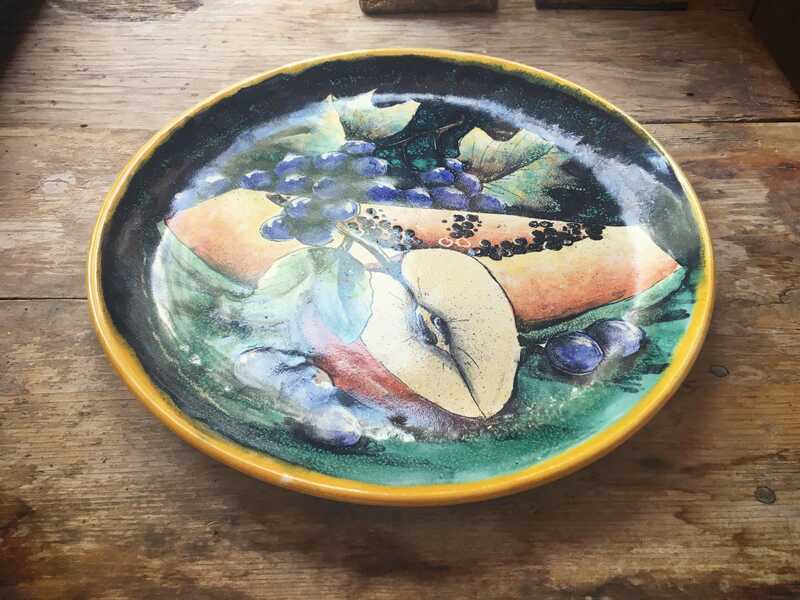 The plate will be double-boxed, which accounts for the heavier weight and shipping costs. 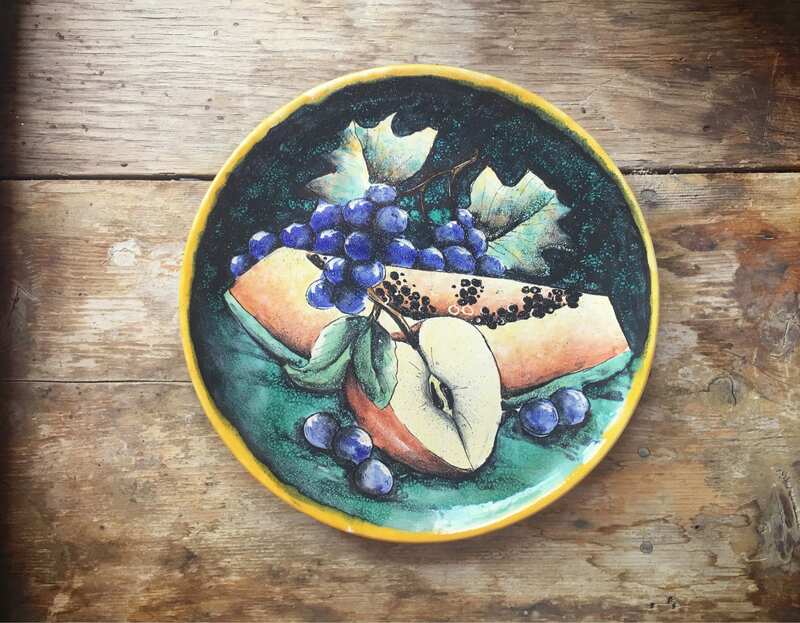 Plate that carries fruit, always.